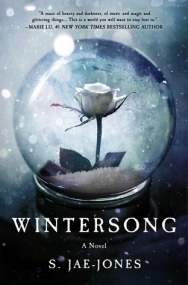 "Wintersong" is a fairytale come to life, featuring Elisabeth (Liesl), the innkeeper's daughter, and the fabled Goblin King, Der Erlkonig. The Goblin King must steal a bride from the world above to maintain both the world above and the world below (of goblins and changelings and other magical creatures). The bride must die to fuel the spring and summer and take away the winter. This is the way it has always been. Liesl is a young composer at a time when it is impossible she should be anything other than a wife. She has been stifled and boxed, herself mostly hidden- as well as her memories of playing with the Goblin King as a child. Liesl adores her brother, Josef, with whom she shares her music. She is jealous of her sister, Kathe, who is beautiful. Liesl is not blessed in terms of her appearance, and she is well aware of the fact. The Goblin King comes to choose a bride and takes Liesl's sister, Kathe. Everyone else seems to have forgotten Kathe ever existed, and the Goblin King challenges Liesl to a game for her sister's life. Will she choose the pretty lie or the ugly truth? The story peels itself away in layers of lies and truths- what the bride means, what the king is, what Liesl and the King mean to each other. It evolves poetically and beautifully as does Liesl's music (oft a focus of the book). The prose is itself lyrical, and really elegantly written. The book is touching and harsh- it's a very emotional ride and impossible to put down or forget. Just like music, this story speaks to the soul. I am surprised this is a YA book- it has some very adult content (in terms of consummating the marriage) and is much deeper than most YA books will go. This is also not a book which could or does finish with everything wrapped up with a pretty bow. I don't want to give spoilers, so I won't say much, but this is not a story which ends with an across-the-board happily ever after. I see the comparisons to "Labyrinth" but I think this is something else entirely, and it reminds me more of the older fairytales which contained ugliness amongst the beauty. Overall, this was a beautiful and fantastic read- I am very curious to read more from this talented author. Please note that I received an ARC from the publisher through netgalley. All opinions are my own.